Addressing racial bias and its impact on racial narratives in Minnesota newsrooms can make people feel uncomfortable. According to Samuel Simmons, the first keynote speaker for the Truth and Transformation Conference, discomfort is a necessary catalyst for change. Simmons’ hope, along with other organizers of the Truth and Transformation: Changing Racial Narratives in Media Conference – including The Minnesota Humanities Center, Minnesota Public Radio, KMOJ, Pillsbury United Communities, Hamline University, and ThreeSixty Journalism in the University of St. Thomas College of Arts and Sciences – is that through dialogue, attendees may become more aware of the narratives of people of color in the media. 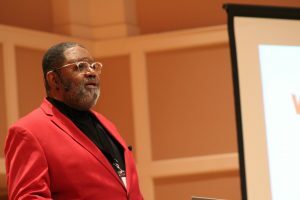 As Simmons’ keynote speech marks the beginning of the two-day conference aimed to challenge and transform racial narratives, he stressed the importance of media professionals’ awareness when it comes to how they portray racial narratives. This “something different” is what the conference is pushing media professionals to pursue. Funded by a $332,000 grant from Saint Paul & Minnesota Foundations through the Truth, Racial Healing and Transformation project of the W. K. Kellogg Foundation, the conference aims to draw attention to inaccurate racial narratives, discuss how they’re harmful and explore how race can be better presented in Minnesota. These conversations will engage more than 300 community members, media professionals, educators and students. The groups will be guided in discussions by the Minnesota Humanities Center. Truth and Transformation conference keynote Sam Simmons speaks to ThreeSixty Journalism reporter and College of Arts and Sciences student Maya Shelton-Davies. 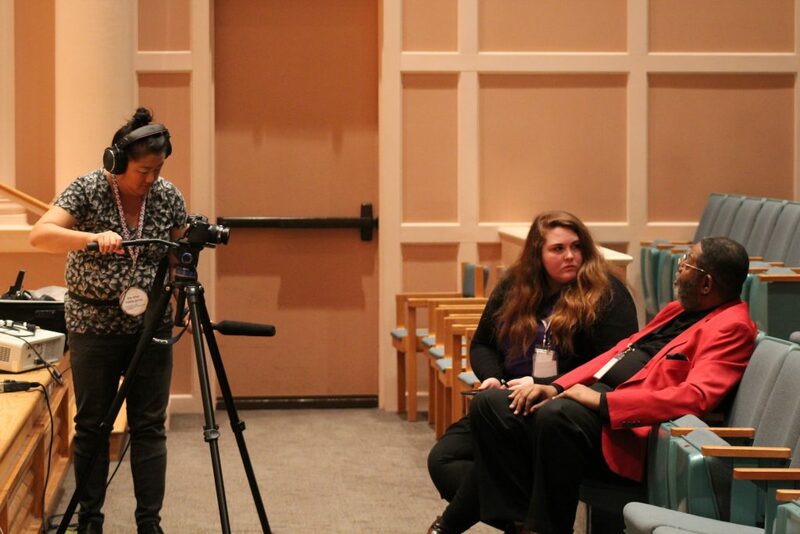 They are filmed by ThreeSixty alumna Hlee Lee, owner of The Other Media Group. According to Simmons, change in how these narratives are told is not only necessary but is needed in order to minimize historical and racial trauma within communities of color. “The more research I did about the media and people of color, the more upset I got. We feel pain almost every time we look at the news,” Simmons said. It’s easy, according to Simmons, for this pain to turn into anger. With Simmons’ 29 years of experience as a behavioral consultant specializing in culturally sensitive trauma-informed strategies, he believes that what the conference aims to achieve cannot be done unless past history and trauma are contextualized. Simmons refuses to mince words surrounding the reality that “media has been used to get people killed,” both in the past and present. In other words, the power media holds and the language used when telling racial narratives can heavily influence public perception. To drive this point home, he referenced multiple instances where language perpetuated violence against different groups by including historic news clippings describing indigenous people as “savages” and Muslims as “terrorists.” Language like this, according to Simmons, incites fear, which can be dangerous for those who are being described in such ways. The issue of how people of color are portrayed in media is tied directly with how the reporting is conducted, according to Simmons. He states this through exploring a concept he refers to as “parallel trauma.” Simmons describes this by touching on the issue of diversity in the newsroom. In discussing parallel trauma, Simmons states that while journalists of color can do their best to change these narratives in their respective newsrooms, the companies they work for don’t reflect the diversity they claim to value in the issues covered. Parallel trauma experienced in the workplace adds to the greater issue of victimization of communities of color, as Simmons points out. When narratives in the media are inaccurate and create harmful depictions of marginalized groups, according to Simmons, the victimization of these communities becomes normalized. “If a community is seen as a victim, people will treat it as such. Even people who like them,” Simmons said. When media only talks about violence in a community, “it regurgitates trauma and grief,” he added. Simmons’ message to conference-goers is that before they do the work they signed up for, they must understand inaccurate narrative further perpetuate the traumas that plague marginalized communities, trapping them in a state of victimhood. According to him, this must change, and in order for that change to happen, attendees have to be open to getting uncomfortable. After Simmons’ speech, the participants headed to small group sessions, which were closed to the media. These conversations centered around the power of the story and stepping into a story sessions, which were led by facilitators trained by the Minnesota Humanities Center. The two-day conference continues Wednesday, March 20. ThreeSixty students will continue covering the conference on social media. Follow the hashtag #NarrativeChangeMN for news from the conference across social media platforms.